Some series have to fight a long time to make it to the small screen, but perhaps none has been in the ring longer than the new Warrior TV show on Cinemax. The late martial arts legend Bruce Lee first conceived of the concept, but passed away in 1973. Decades later his daughter, Shannon Lee, brought the treatment to Justin Lin, and they enlisted Banshee vet Jonathan Tropper to create a thoroughly modern script for this period piece. Now that has made it to premium cable, does it have the mettle to earn a return? Will Warrior be cancelled or renewed for season two? Stay tuned. 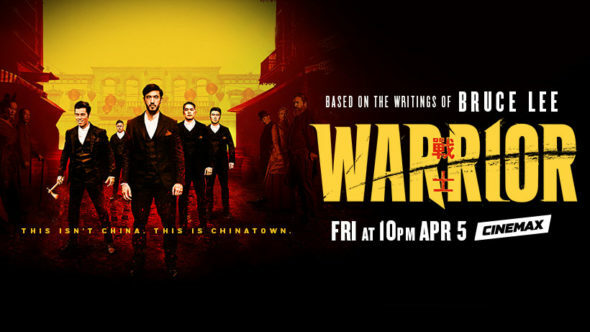 A Cinemax action drama, Warrior stars Andrew Koji, Kieran Bew, Olivia Cheng, Dianne Doan, Dean Jagger, Langley Kirkwood, Hoon Lee, Christian McKay, Joe Taslim, Jason Tobin, Joanna Vanderham, Tom Weston-Jones, and Perry Yung. The series follows Chinese immigrant Ah Sahm (Koji), who arrives in San Francisco in 1878, during the Tong Wars, to look for his sister, Mai Ling (Doan). As a gifted fighter, it is not long before one of the local organized crime factions, known as a tong, recruits Ah Sahm to be its hatchet man. The story also centers on the racial tensions of the time between Chinese and Irish immigrants, and their dealings with the cops and politicos. What do you think? Do you like the Warrior TV series? Should this Cinemax TV show be cancelled or renewed for season two?